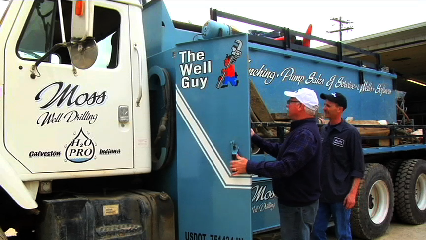 Indiana Wells and Water Treatment | Moss Well Drilling, Inc.
Moss Well Drilling, Inc. is a third-generation family business that has been providing top-notch service since 1946. Our business was built on a basic concept that still exists today: service, service and service. The goal of Moss Well Drilling, Inc. is to ensure that our customers have complete satisfaction with the services we provide. Aside from providing an excellent customer experience, we also take pride in protecting our most important natural resources. We offer an extensive list of services that range from well drilling to water treatment. Contact us today at 574-699-6773 or 800-949-9009 to schedule a consultation. Our friendly and knowledgeable staff is awaiting your call. A live person will answer the phone! *Military and Senior Citizens Discounts Available! We serve the counties of Benton, Boone, Carroll, Cass, Clinton, Fulton, Grant, Hamilton, Howard, Jasper, Madison, Marion, Miami, Montgomery, Newton, Pulaski, Tippencanoe, Wabash and White. This includes the communities of Anderson, Crawfordsville, Delphi, Fowler, Frankfort, Goodland, Indianapolis, Kentland, Kokomo, Lafayette, Lebanon, Logansport, Marion, Monticello, Morocco, Noblesville, Peru, Rensselaer, Rochester, Tipton, Wabash, Westfield, Wheatfield, and Winimac.